Judy Collins called her latest anthology, Forever. But this 1997 release has already "rotted", at least our archive copy has. We were recently moving our collection to a new location when we did a spot-check. Both discs were covered with a sticky goo on the playing side of the discs [see pics]. Clearly they were unplayable. The Elektra album has only these identifiers on the CD: "Made In USA by WEA Manufacturing INC, 62104-2. For promotional use only. Sale or other transfer is prohibited." Aside from this small-print mention on the printed side of both CDs, there was no indication that this was a promo copy. 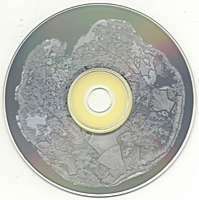 We like to ask any other owners of this album to contact us and let us know the condition of their copy. Please email BigO at singbigo@singnet.com.sg and put in the subject header: FOREVER? Ah well, Collins did offer advice on CD2, track 15, Nothing Lasts Forever.